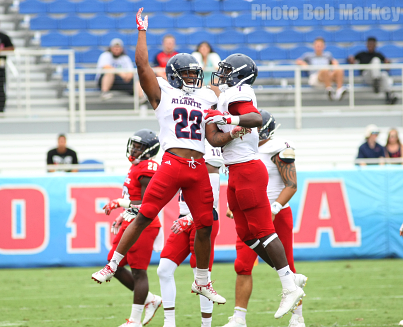 Florida Atlantic University football concluded the 2017 Spring season with the annual Red/White game, which was held in FAU Stadium. The defense, which wore white for the afternoon, used the home locker room and roamed the field from the home sideline. Using the modified scoring system, they took the game 62-33. Jason Driskel led the quarterbacks with a 19-25, 344 yards, 3TD, INT showing. Brandon Robinson hauled in four catches for 120 yards to lead the receivers. Devin Singletary ran for 52 yards on seven carries to pace the running backs. Sophomore LB Rashad Smith had a contest best nine tackles to go with a sack, while Hosea Barnwell (8) and Damian Horton (7) also had productive efforts in tackling. Korel Smith, Ocie Rose, and Herb Miller were each credited with interceptions. “Pretty successful day from a health standpoint, which in these games unfortunately a lot of times is the number one thing you want to come out with. As much as you want to see guys tackle and play, we’ve all been a part of those spring games where you lose a significant player and the whole thing feels like it was useless, so that was good", said Head Coach Lane Kiffin. The Owls will open their 2017 season when they host Navy on September 1st at 8:00 PM in FAU Stadium. For season tickets call 1-866-FAU-Owls.